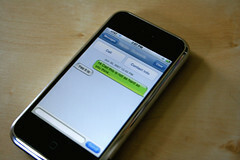 MANILA – The high rate of mobile phone usage in the Philippines provides the ideal condition to implement a tax on SMS messages. At a press conference held on November 16th in Manila the Managing Director of the International Monetary Fund Christine Lagarde suggested that the Philippines could charge a small tax on sending SMS messages in order to complement the government’s current efforts to improve the country’s budgetary position. The Philippines currently has one of the highest mobile phone usage rates in the world, with the average mobile phone user sending approximately 600 SMS per month. This is not the first time that a suggestion has been raised in the Philippines to apply taxes to SMS messages, with a proposal to levy a tax of PHP 0.05 per message already having been rejected by Congress in 2009, despite estimates that implementation of the measure could have boosted government revenues by as much as PHP 36 billion.